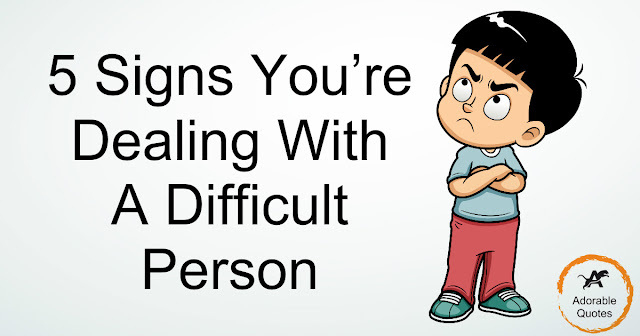 Difficult people are everywhere in our lives. They come in all colors, shapes, sizes, religions, and nationalities. But, how do you pinpoint the signs that you are dealing with a difficult person when you first meet someone? Sometimes we are sucked right into their pessimism without warning. Or, perhaps we just don’t notice the hints. 1. IT’S ALL ABOUT THEM. Difficult people are dramatic and they are fueled by reactions from others. They need to be the center of attention. You know this type of person, the one whose life seems to be a soap opera. You ask her what she did during the weekend and she moves through elaborate story lines. These folks don’t just tell a story in a few sentences. They share a novel. And, to even ask them, “How are you doing today?” is opening a can of worms. They are egocentric, narcissistic, and full of opinions. 2. THEY DON’T DO A FAVOR WITHOUT COLLECTING. These type of people are always scheming how they can get something for nothing. If you ask them for a favor, realize it will be like selling your soul to the devil. That favor will not go unnoticed. Difficult people are not compassionate. They are self-serving. These folks will remind you over and over what they did for you. Never mind that you have helped them in the past. That’s not in their best interest. They will bully you to repay whatever support or assistance you got from them. The victim is the one who never gets over a trauma. They are stuck in the past. They utilize illnesses, family, and events to manipulate into getting what they want. They live in constant victimization mode. These people will reel you into their lives by making you feel sorry for them. They tell and re-tell stories of pain and failures. Negativity is their means of communication. The best way to stop their behavior is to continue giving positive statements and not buying into their pity party. 4. THEY CAN BE OBLIVIOUS. Believe it or not, there are people out there who have no idea what’s going on in this reality. They live in their own world that only makes sense to them. These type of people are difficult because they are in constant denial of what’s going on. They are flaky. They can be intolerable and hard to handle. These are not the people who are dreamers and trailblazers. These are the ones who bring about drama by creating a world that is not understood. They are delusional. It’s hard to actually have a serious conversation with the oblivious person. You hope they get the notion that the universe doesn’t revolve only around them. 5. THEY WHINE, BLAME AND GOSSIP. The truth is that a person who is sharing gossip with you is also telling your business to others. They blame everyone for their mishaps. They whine about the weather, the boss, the traffic, and anything that can bring on attention. They complain about everyone. They make up stories, embellishing details to make them seem more interesting. In order to stop the nonsense, you have to express your disgust about their behavior. Difficult people don’t like when the tables turn and they are no longer in charge of stories. When they don’t get what they want from you, they move on to someone else. They don’t appreciate being called out about their negativity. They are those people who just can’t find the speck of sunshine on a cloudy day. They move through manipulation, control, and bratty behavior. You start to see their signs the minute they show zero empathy for another. All you can do is stop the behavior with positive reinforcement, and let them know that you will not tolerate their attitude. We must be grateful for those rude and obnoxious souls who show us what we are never to become.